TRUTH: The best way to ensure you are not a Marketing Jerk is to be developing vital content your audience cares about, and distributing it in complementary ways to entice them to engage with you. The best content is the vital content your reader is looking for RIGHT NOW to solve some point of pain in their place of business. Unfortunately, in our ‘Clicks, Likes and Shares counting’ online marketing media world, we find the pressure to achieve only one thing: Getting Our Messages To Go Viral! Because, Viral = More Business right? And, while this concept could be true for mainstream products and services, like technology advances (think Apple iphones) and men’s fragrance lines for instance, it certainly does not apply to all markets. Specifically, it doesn’t apply often to the highly technical world of industrial manufacturing, and healthcare products and services for instance. I can’t recall when a cool new healthcare software meant for the mass market came out and went viral, though a few should have ie: www.itriagehealth.com. WARNING SIGNS: When a marketer asks if their next post will go viral…it’s in that very moment, a good or even great marketer can find themselves transforming into – a Marketing Jerk. It is often difficult to tell when you are being a Marketing Jerk. I am guilty of being a Marketing Jerk. Who isn’t? I promise I’ve reformed, but for those of you wondering if you could be a Marketing Jerk, read on. A Marketing Jerk is a person or team who continues to promote all the wrong things, never getting to the point of what the product or services benefits to the customer are or can be. The easiest way to tell if you’ve received a message from a Marketing Jerk? The content is often a lot of marketing-speak, jargon such as: “the premier provider of solutions to bring together your systems and promote financial returns on your investment“. All fluffy potatoes, but no meat or substantive content. Where’s the beef? What solution(s)? Which systems? Are they software systems or operations, sales or marketing systems? What kind or how measurable are the returns (monetary, efficiencies, equipment uptime) other clients are getting for your “solutions?” How much do your services actually cost or what is the value they provide? Too often, it is the marketer who spams their list, whether earned or purchased, endlessly in desperation, with every service offering or product available under their roof, attempting to get a nibble or a click count to measure their effectiveness. This is especially true of the “ME TOO” companies who have competition but have not done their best to differentiate their company’s key offering(s) or Hedgehog as defined by Jim Collins in his book titled Good to Great. The precious list of gold (suspects and prospects) you are squandering with your spam emails, touting your awesome solutions in less than awesome ways, exhausts your list members. They will soon disregard your incoming mail as irrelevant and ignore your messages (read here DELETE your messages before even reading them), unsubscribe, blacklist your email internally (this way it won’t populate their inbox at all) or blacklist you on national mail servers (IT teams love to spend their time getting your domains cleared from these – NOT!). Some disgruntled recipients even report Marketing Jerks to the FCC (this comes with a possible hefty $$$ fine PER INCIDENT). HOW CAN YOU TELL IF YOU ARE A MARKETING JERK? If you are doing any of these things…You are a Marketing Jerk! 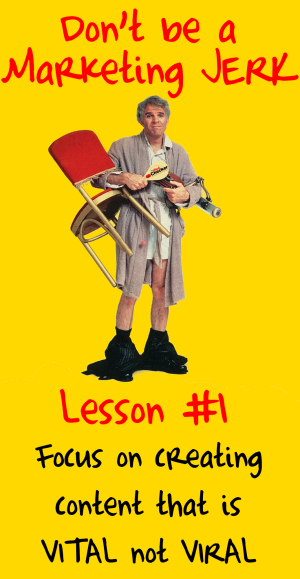 Up Next: Don’t Be a Marketing Jerk – 1.1 How do you STOP being a Marketing Jerk if you are one? Click the image below to request your free copy of Becoming a Thought Leader in your Industry Through Social Media. Thank You. How May I Be Of Service To You?